In many ways, Dillard's seems like the perfect stock. During the Great Recession, Dillard's stock briefly plunged below $3. Now it trades for more than $90, meaning that shareholders have received a better than 3,000% return in less than five years. 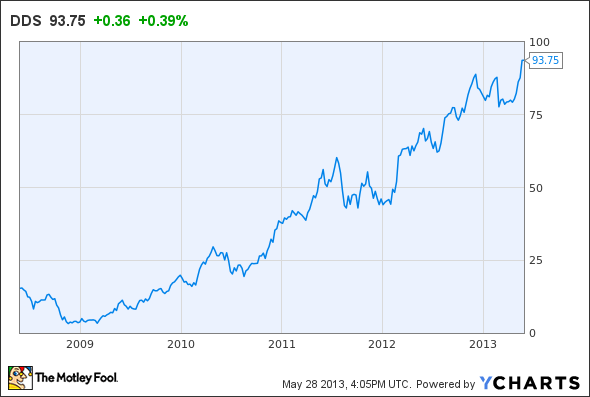 Dillard's 5-Year Price Chart, data by YCharts. Dillard's gains have been driven by solid earnings growth, which most analysts expect to continue. However, I think that Dillard's is setting investors up for disappointment. The company's revenue momentum has dissipated, and the department store sector will remain as competitive as ever going forward. Accordingly, I expect Dillard's strong run to end this year. The primary driver of Dillard's strong stock performance over the past five years has been an improvement in sales. Comparable-store sales rose 3% in 2010, rose by another 4% in 2011, and then rose by 4% again in 2012. This appears to indicate strong momentum, but a closer look at quarterly results reveals a deteriorating trend. Dillard's posted comparable-store sales growth as high as 5% in third-quarter 2012. As I have argued previously, Dillard's probably benefited from last year's sales meltdown at J.C. Penney , one of the largest mall-based department stores. With shoppers abandoning J.C. Penney in droves last year, Dillard's, Macy's , and other similar retailers experienced a nice sales tailwind. However, comparable-store sales growth slowed to just 3% in the fourth quarter last year. This caused a brief correction for Dillard's stock before it began marching higher again. Finally, Dillard's comparable-store sales grew by just 1% in first-quarter 2013. The company outperformed on gross margin, which rose from 38.8% to 39.9%, enabling Dillard's to beat the analyst consensus for profit. However, with gross margin approaching 40%, it will be difficult to drive further profit growth through margin expansion alone. Sales growth will be needed. The slowdown in sales growth is particularly troubling because Dillard's did not face as much of a negative impact related to weather as other competitors, since most of its stores are located in the South. By contrast, Macy's faced a bigger weather-related impact but continued to post strong growth, with comparable-store sales up 3.8% last quarter. If Macy's continues to gain market share from Dillard's, it will be better able to leverage its fixed costs, making it harder for Dillard's to compete. The big risk for Dillard's going forward is that the tailwind it received from J.C. Penney's struggles could reverse later this year. J.C. Penney experienced a big management shakeup last month, with CEO Ron Johnson being replaced by his predecessor, Mike Ullman. Ullman has made it clear that he aims to lure back previous J.C. Penney shoppers by bringing back coupons and frequent sales, while reintroducing popular private brands that were removed during the chain's recent makeover. While I am far from optimistic about J.C. Penney's long-term prospects, I do think that Ullman's strategy will win back some of the market share that J.C. Penney lost last year. Other mid-range mall-based department stores like Macy's and Dillard's -- which were the primary beneficiaries last year -- will face stiff competition during the back-to-school and holiday seasons. Since Dillard's is already losing some share to Macy's, it could be hit hard by a J.C. Penney sales revival. While Dillard's has generated strong earnings growth over the past several years, it has become increasingly reliant on margin improvement and share buybacks recently, rather than organic sales growth. Comparable-store sales growth dropped to just 1% last quarter, and Dillard's could face a worsening competitive environment as J.C. Penney moves aggressively to regain share. With the stock trading for nearly 13 times earnings, I think investors should steer clear of Dillard's for now. What about the JCP story? The article Why I Don't Believe the Dillard's Story originally appeared on Fool.com. Fool contributor Adam Levine-Weinberg has no position in any stocks mentioned. The Motley Fool owns shares of Dillard's. Try any of our Foolish newsletter services free for 30 days. We Fools may not all hold the same opinions, but we all believe that considering a diverse range of insights makes us better investors. The Motley Fool has a disclosure policy.